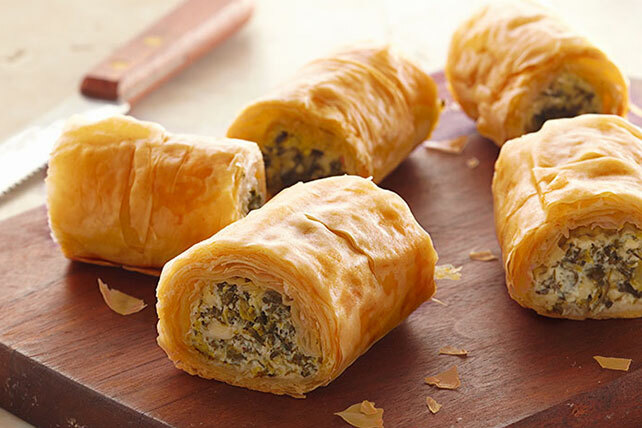 Keep Make-Ahead Spinach Phyllo Roll-Ups in the freezer and pop one in the oven for a quick appetizer later. These spinach phyllo roll-ups are delicious. Mix first 5 ingredients until blended. Brush 1 phyllo sheet lightly with butter; top with 2 more phyllo sheets, lightly brushing each layer with some of the remaining butter. Place remaining phyllo sheet between 2 sheets of plastic wrap until ready to use; set aside. Spread 1/5 of the spinach mixture along one short side of phyllo stack. Fold in long sides of phyllo; roll up from one short side to make log. Repeat with remaining phyllo sheets and spinach mixture to make 4 additional logs. Brush with remaining butter. Make small cuts in tops of logs at 1-inch intervals. Place in large freezer-weight resealable plastic bags or wrap tightly in plastic wrap. Freeze up to 3 months. When ready to bake, remove desired number of logs from freezer. Refrigerate, tightly wrapped, several hours or overnight until thawed. Unwrap, then place on baking sheet. Bake in 375°F oven 25 min. or until golden brown. Cool 5 min. Transfer to cutting board. Use serrated knife to cut each log into 6 slices. Leftover phyllo sheets can be wrapped tightly and refrozen. Use a total of 9 phyllo sheets, spreading 1/3 of the filling on each stack of 3 sheets and rolling. (You will have 3 logs.) Freeze, then bake as directed. Cut each log into 10 slices to serve. Omit butter. Spray phyllo sheets with cooking spray instead of brushing with the melted butter.